It was the fairytale wedding of the year. An American Actress marrying an English Prince. The wedding of Meghan Markle and Prince Harry took place on the 19th of May 2018 in St George's Chapel at Windsor Castle in the UK. A huge floral arch greeted the Royal couple at the entrance to chapel, made up of an abundance of white and the palest yellow flowers which included white roses, forget-me-nots, sweet peas, lily of the valley and jasmine. 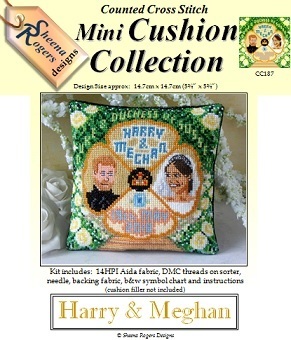 This cross stitch design features the newly married couple framed with these flowers, with the chapel steps along the bottom edge, a motif of the aquamarine ring Harry gave to Meghan as a wedding gift, and the couple's new titles - the Duke and Duchess of Sussex. Only whole cross stitch is required with a little backstitch for the facial details.